Aurmazl Zudeh is a Golden Saint Officer and Captain of the Palace Guard. If you are the Duke or Duchess of Mania, she will warn you of Jyggalag's attack on the Palace and aid you in the following battle. She is enabled at the beginning of the related quest. 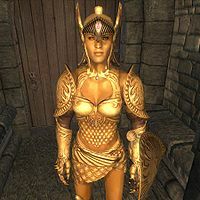 She wears a leveled suit of full Golden Saint armor, a leveled Golden Saint shield and a leveled Golden Saint helmet. She wields a leveled Golden Saint weapon. She also has a small chance (10% each) of carrying a random gem, a random potion and a random scroll. In addition, she will also be able to cast a set of standard Golden Saint mage spells. 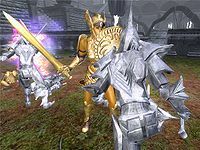 When you have immersed the Staff of Sheogorath into the Font of Madness and gained the power of Sheogorath, a Golden Saint Messenger will come running up to you, eager to share a message from Zudeh: "My Lord! Aurmazl Zudeh sent me to find you. She requests your immediate assistance." When asked what the Aurmazl wants, the messenger will say: "I don't know, My Lord. She only said it was a matter of the gravest import to the security of the Realm." If you imply that Zudeh is in no position to hand out orders, she will respond: "Please accept my pardon, Lord, if I gave you such a false impression. The fault is entirely mine. The Aurmazl merely wants you to know that matters of the gravest import to the Realm's security may be at stake. If it please my Lord, she requested also that I inform you that time is of the essence, in her humble opinion." On your way out of the Palace, Aurmazl Zudeh herself will come rushing in and say: "My Lord. I'm glad to see you. We have a developing situation that requires your attention." If you comment to the Aurmazl that nothing is required of you she will humbly say "Of course, My Lord. I meant no disrespect. My zeal in the Realm's service got the better of my judgment. The situation is this. An Obelisk of Order has activated in the Palace courtyard. My Aureals are engaging the Knights as we speak. We will defend the Palace to the end of our strength, and will cast ourselves in the path of cursed Jyggalag himself should he come here." If on the other hand you ask her for an explanation she will fill you in: "Order. An obelisk has activated just outside the Palace. I've ordered my Aureals to engage the enemy. I expect that this is the beginning of the final assault. The cursed usurper Jyggalag himself may even take the field before the end. What are your orders, My Lord?" The battle strategy is up to you; either tell the Aurmazl to attack with all your strength or that you will lead the battle yourself. The first option will cause her to say: "With pleasure, My Lord! My Aureals will gladly die in Your service!" and rush out the door. The second option will make her say "It will be our great honor to fight by your side, My Lord!" She will then follow you outside in the courtyard and fight alongside you, rushing to attack the new Obelisks as soon as they appear. When Jyggalag himself arrives on the battlefield, she and her followers will die in the resulting blast. The End of Order: Fight the last battle against the forces of order and Jyggalag. Even though she is nominally an Aurmazl, she is actually a Pelaurig, the highest rank in the Golden Saint hierarchy. She is replaced by Autkendo Jansa if you are the Duke of Dementia. This page was last modified on 15 October 2017, at 01:32.